So Death Cab for Cutie has finally released the much anticipated, “Narrow Stairs”, which I originally wrote about in my post, “Some Death Cab-related goodness“, and the first thing that I noticed was that I was obviously wrong: the track “Casino Blues” that I mentioned in that post does not appear anywhere on the release, which is disappointing. Damn you, unreliable sources! Apart from that, however, the album rocks. Quite aside from the much-touted and much-talked-about 9-minute-mammoth, “I Will Possess Your Heart”, this album is perhaps on of the most complete albums I’ve heard from Death Cab for Cutie. In most previous releases, when you get right down to it, the musicality of the band was overshadowed by Ben Gibbard’s lyrics. Not so with “Narrow Stairs“. With this release, the band as a whole comes across as a far more powerful unit… more muscular, and more a part of the final whole. And that’s a great thing. 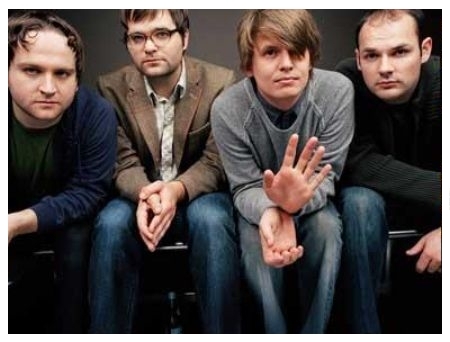 While previous Death Cab releases have been filled with Gibbard’s existentialist pessimism, “Narrow Stairs” seems – to me, at least – to be their darkest release, in terms of actual physical and tangible doom. And after re-reading that sentence, I realise I should clarify that that is actually a good thing. Clocking in at only 44 minutes, the only problem with the album is that it ends far too soon. I found it difficult to know which tracks to post here as a sampler, as – for the most part, apart from a few awkward tracks – the album is full of great tunes. “Your New Twin Sized Bed” and the alt.country style “Cath…” were strong contenders. In the end, however, it was the stunning album opener, “Bixby Canyon Bridge” and the doomed-relationship closing track, “The Ice is Getting Thinner” that won out. I wasn’t quite sure what to expect from this album….from the 9 minute long lead single…but like you, I was happy as well! … man, it just gets me.